Palm Springs, a small desert oasis 100 miles east of Los Angeles, was Frank Sinatra's home for fifty years. During his brief yet turbulent marriage to Ava Gardner, Palm Springs was center stage. And for the rest of his life, the Rancho Mirage compound on Frank Sinatra Drive was the sanctuary he called "My Heaven." Palm Springs still feels the ghost of the legendary performer. 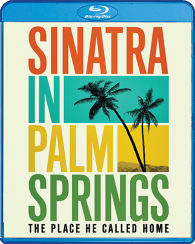 In this documentary film, director Leo Zahn explores Sinatra's deep attachment to Palm Springs and the Coachella Valley, capturing the spirit of the Sinatra era and paying tribute to his unique lifestyle. Featuring more than fifty clips from his movie and television appearances as well as revealing interviews with Barbara Sinatra, Mel Haber, Tom Dreesen, Bruce Fessier, Trini López, Michael Fletcher and many others who knew and lived and played with Mr. Sinatra, Zahn offers a fascinating insight into a true icon of entertainment.